Most people know that consuming vegetables, especially cruciferous vegetables such as broccoli, is an essential part of a healthy diet. But what is it that makes these vegetables so healthy? It is only within the past 20 years that scientists have been able to unlock the mechanisms and measure the value of specific phytonutrients within these plants. Specifically, understanding how they boost the body’s own protective systems such as combating oxidants and inflammation and protecting against damage caused by free radicals. 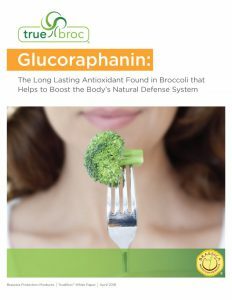 Glucoraphanin is a powerful and long-lasting antioxidant, found primarily in broccoli. However, the amount varies tremendously from one broccoli plant to another with no way for consumers to tell how much glucoraphanin is in the broccoli they buy. It has also been shown that this phytonutrient is present in much higher concentrations in the broccoli seeds and 3-day old broccoli sprouts. 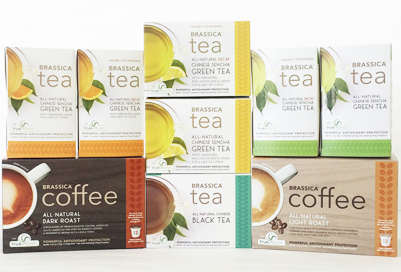 Brassica created TrueBroc® glucoraphanin from broccoli seeds in order to provide consumers with a concentrated source of glucoraphanin that contains consistent and meaningful levels. Glucoraphanin belongs to a category of compounds called glucosinolates which are naturally found in cruciferous vegetables. Glucosinolates are enzymatically converted into isothiocyanates, which are active in the body. This enzymatic conversion is performed by myrosinase, which is also found naturally in cruciferous vegetables. Read more about this super phytonutrient in our latest glucoraphanin 101 paper. Myrosinase-like activity also occurs in our intestinal microflora so if glucoraphanin is consumed by itself, our gut microflora will convert a portion of it to sulforaphane. As in many types of metabolism modulated by the microbiome, this conversion rate varies from individual to individual. 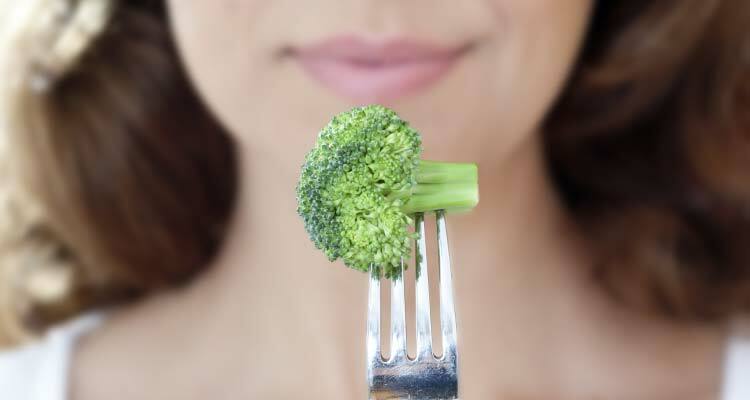 Sulforaphane belongs to a group of compounds called isothiocyanates. In 1992, Dr. Paul Talalay, MD and colleagues at Johns Hopkins School of Medicine identified sulforaphane as the most potent natural inducer of Phase 2 detoxification enzymes. These enzymes eliminate many types of free radicals and environmental pollutants and trigger ongoing antioxidant action that lasts for up to three days. These compounds and their mechanisms have been studied extensively and are supported by more than 1,700 scientific publications. The human body has an impressive set of overlapping systems of detoxifying enzymes that protect the body from both extrinsic and intrinsic assaults. These same Johns Hopkins’ scientists spent decades understanding the basic molecular systems that the body uses to protect itself from damage. They discovered that these detoxifying enzymes did not normally work at full capacity, but that natural components from cruciferous vegetables were able to boost the function of these protective processes to be more effective. They surveyed the fruit and vegetable kingdom and discovered that broccoli contained some of the highest levels of these compounds.